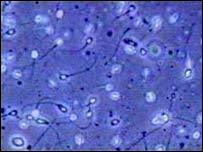 Scientists are developing a male contraceptive drug which stops the development process of sperm. Tests on rats show blocking connections to cells which "nurture" developing sperm makes the animals infertile. The US and Italian researchers say they used relatively low doses of the molecule and found no obvious side effects, and the effect was reversible. But they told Nature Medicine that work was now needed to see if their approach is equally effective and safe in men. When sperm are being made in the body in a process called spermatogenesis they sit next to other cells, called Sertoli cells, which nurse and help them grow. If the connection between these two cell types is broken, infertility can result in men. In the study authors used a recently developed molecule called Adjudin to dislodge the developing sperm from the Sertoli cells. However Adjudin is also known to be toxic at high doses. To get round this, the researchers linked it chemically to a hormone, called FSH, which acts in the testicles where sperm are made. The FSH, which the researchers made inactive so it would merely act as a carrier and not cause any effect itself, delivered Adjudin to where it was needed, allowing much lower doses to be given. This made the developing sperm cells "fall off" too early, before they were properly mature, resulting in complete but temporary loss of fertility in the rats. More research is needed to assess if the same approach could work in humans. But the researchers, led by Dr Dolores Mruk, from the Center For Biomedical Research in New York, said: "We anticipate that this compound could become a male contraceptive for human use." He said it appeared the drug effects could be fully reversible, although only a single dose was given in the study. "Clearly there are enormous amounts of work needed to translate this to humans. "Adjudin may be ineffective in men, as the biochemistry of the cell junctions it targets may be different, and the precise molecular basis of its mechanism of action is unknown. "However, perhaps the most important aspect of this study is the demonstration that using FSH targeting, drugs that are otherwise too toxic, can be delivered in safe yet effective doses."